Carthus was once a violent land filled with pyromancers. The warriors that existed there were considered to be very powerful and used curved weaponry. The Carthus swordsmen were very pragmatic, and unlike “noble” knights, they attached all glory to victory. There was no “dishonorable” path to victory, after all, the dead kept no honor. Carthus warriors did not only use pyromancy to destroy the weapons and armor of their foes, they also used it to improve themselves and their fighting styles. Sometimes it was by infusing their blades on fire using the Carthus Flame Arc pyromancy. Other times it was to improve the power of their blows. From the Carthus Beacon pyromancy, which also describes their warlike nature. The pyromancies of Carthus are noted to be different than others. This is explained by the Carthus Pyromancy Tome as being due to their “being developed in isolation”. At one point, all of Carthus would be united under one high lord. This was Wolnir, a paranoid and deadly man, who did not care for the Gods. Wolnir was able to command the complete loyalty of the Carthus warriors, and seems to have been a very successful conqueror, as he conquered most Kingdoms known to his people. He was paranoid ruler who sentenced many to their deaths. But all men’s rule must come to an end, and Wolnir’s was no different. Eventually, he was swallowed by the Abyss, which caused him to seek comfort from the Gods for the first (and last) time. I don’t know what caused this, but it could have come about due to Wolnir’s actions, or perhaps he dug too deep for power. In any case, Wolnir took a holy sword and armlets stripped from clerics as comfort. After Wolnir fell to the abyss, he discovered something in there, the black flame. His former soldiers would become Grave Wardens, and learn more of the forbidden flame. The first black flame pyromancy discovered seems to have been the Black Serpent Pyromancy, as it inspired the other grave wardens, and continues the idea of the abyss having its own will. Other flame arts discovered by the Grave Wardens include the Black Fire Orb and Black Flame, which for the most part state the same information, which is restating that they were discovered after Wolnir’s fall. Eventually, you meet Lord Wolnir after somehow being pulled inside of his skull. Once there, he seems gigantic, which might just be his representation, as the skull that pulls you in is human sized. There, Wolnir commands the ghosts of his former warriors, and by shattering his armlets, the symbol of his comfort, he disperses into the abyss. Yhorm's soul states, "Yhorm is the descendant of an ancient conqueror, but was asked by the very people once subjugated to lead them." Though some may believe that this refers to the Giant Lord from Dark Souls 2, it is apparent that the lore of 2 has little to no consequence in 3, outside of some references in item descriptions. It seems much more likely, therefore, that Yhorm's ancestor is someone else. Though the inhabitants of the Catacombs seem to be human skeletons, Wolnir is massive. This could be the influence of the Abyss deforming him, but it may also be that he was a giant in life. This would help explain how he was able to easily crush the other lords of Carthus and become its conqueror. Additionally, if we assume that the Profaned Capital is a part of Carthus, it makes perfect sense that the people "once subjugated" would be the descendants of the humans that were conquered by Wolnir, as it was the people of the Capital that asked Yhorm for his leadership. If Yhorm were the descendant of a ruthless tyrant like Wolnir, it would also explain why he is described as "Lonely Yhorm" in his Cinders of a Lord item. The people of the Capital likely shunned him due to his race and bloodline. It's probably during this time Siegward of Catarina befriended the lonely giant. 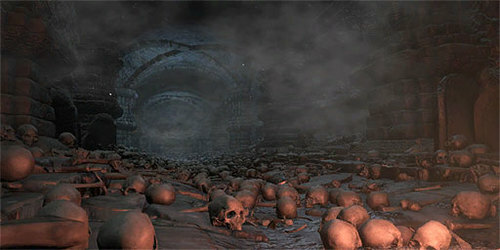 There are other connections between the Catacombs and the Capital. Both are underground and close to each other geographically, and both are consistently linked by mentions of pyromancy. The Grave Warden Pyromancy Tome and the Carthus Pyromancy Tome both show that pyromancy had a strong tradition in Carthus, and each dark pyromancy references Wolnir specifically. The Profaned Capital, similarly, is marked by the devastation of the Profaned Flame, which also exists in-game as a pyromancy. 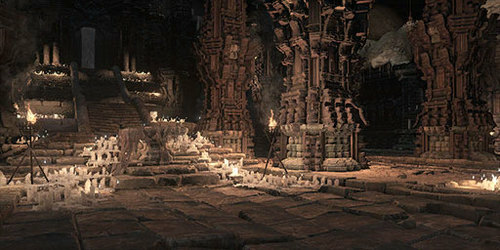 Lastly, every area in Lothric is linked to a Lord of Cinder in some way, but there is no Lord associated with the Catacombs. This would be explained, however, if the Catacombs and the Capital were linked, as they would both be the lands of Yhorm. Umbral ash of the grave warden of the catacombs of Carthus. With this, the shrine handmaid will prepare new items. The old man began as a squire, carrying his master's accoutrements. He ended his days a grave warden, and carried them still. A pyromancy tome from Carthus containing pyromancies crafted for battle. Give to the old master pyromancer to learn advanced pyromancies of the Great Swamp. Carthus pyromancies developed in isolation from other forms, explaining their divergent evolution. The most obscure pyromancy developed in Carthus of the Sands. Damage increases with consecutive attacks. Carthus's aggression has been likened to an uncontrollable fire, and since ancient times its beacon has been used as a signal for war. Pyromancy of Carthus of the Sands. Reinforces right weapon with flame. Warriors of Carthus favored supplemental pyromancies such as this, which was used to enhance the curved blades of its swordsmen. Ring worn by warriors of the sand kingdom, Carthus. Boosts rolling invincibility, at the cost of defense. The sword technique of Carthus allows for fluid movement with a curved sword. Masters of the technique are said to dazzle their opponents by moving as weightlessly as a grain of sand. They live for their High Lord Wolnir, conqueror of most kingdoms known to their people. Ring worn by the warriors of the sand kingdom, Carthus. Slightly boosts dexterity and obscures the wearer while rolling. Strangely curved sword crafted to cause bleeding, wielded by Carthus swordsmen. Shaped to sneak around the defenses of shields, this sword requires ample dexterity to wield effectively. Curved sword of Carthus swordsmen. This weapon's thick, heavy blade is crafted to cause bleeding, and requires ample strength and dexterity to wield effectively, suggesting that the swordsmen of Carthus were amongst the mightiest. Large curved sword wielded by swordsmen of Carthus. The lightest of the curved greatswords. Crafted to cause bleeding. The tattered remnants of a leather shield used by a Carthus swordsman. The swordsmen of Carthus were particularly agile, and this common shield is surprisingly light for one of medium size.